How to Apply for SBI POs Recruitment: State Bank of India, SBI has released the recruitment notification for this year's Probationary Officers POs Exam. The notification is now available on the official website sbi.co.in. 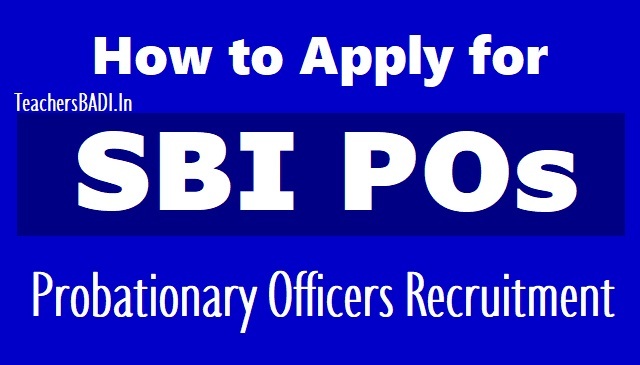 The candidates interested in applying for SBI PO 2019 recruitment process are required to fill the online application form. The online application process would be available from today, April 2 to 22, 2019. Check the important dates, eligibility, details of SBI PO vacancy for 2019 and how to apply online here. Please note that the official notification is now available on sbi.co.in/careers. SBI PO Recruitment 2019 online application process has begun today on the official website of State Bank of India – sbi.co.in. SBI aims to recruit 2000 candidates for the post of Probationary Officer. The application window will be open till April 22; thereby candidates interested to launch their banking career with India’s largest money lender must apply online on or before the due date. Candidates interested in applying for SBI PO 2019 are required to fill the online application form. The forms are available on the official website. Direct Link to the same is also provided here. Candidates would be required to pay a fee of Rs 600 (for general category) and Rs. 100 for reserved category. Also, candidates would be required to upload their signature and photograph. These details are provided on the official notification available. Candidates interested in applying are advised to please go through the official notification carefully before filling the online application form. In order to apply, interested candidates can click on the Online Application Form for SBI PO 2019. A new window would open. Candidates are required to register online on the page and provide the information. Please remember, application would be considered complete once the fee is deposited. Also, candidates can only fill the online application and are required to pay the fee through online mode. Fee would not be accepted through challan. Step 5: Enter the required details correctly such as your name, date of birth, contact details, educational qualifications etc. Step 6: Upload scanned copy of your photograph and signature. Step 8: Pay application fee through Debit card/Credit card/Netbanking. ii) Candidates to visit Bank's website www.statebankofindia.com or www.sbi.co.in and open the appropriate Online Application Format, available in the ‘careers with us’ link. iii) Fill the application carefully. Once the application is filled in completely, candidates should submit the data. In the event of candidates not being able to fill the data in one go, they can save the data already entered. When the data is saved, a provisional registration number and password will be generated by the system and displayed on the screen. Candidates should note down the registration number and password. They can re-open the saved data using registration number and password and edit the particulars, if needed. This facility will be available three times only. Once the application is filled in completely, candidates should submit the data. No change /edit will be allowed thereafter. The registration at this stage is provisional.iv) After ensuring the correctness of the particulars of the application form, candidates are required to pay fees through the payment gateway integrated with the application, following the instructions available on the screen. v) The payment can be made by us ng debit card/ credit card/ Internet Banking by providing information as asked on the screen. Transaction charges for online payment, if any, will be borne by the candidates. vi) On successful completion of the transaction, e-receipt and application form will be generated; which may be printed for record. The printout of the application form is not to be sent to the Bank. vii) If the online transaction is not successfully completed, please register again and make payment online. viii) There is also a provision to reprint the e-Receipt and Application form containing fee details, at later stage. Applicants must fall in the age bracket of 21 to 30 years as on 1st April 2019. Age relaxation rules apply as per current norms. The selected candidates will be eligible to receive basic pay of Rs. 27,620/- (with 4 advance increments) in the scale of Rs.23700-980/7-30560-1145/2-32850-1310/7-42020 and will be placed in the Junior Management Grade Scale-I. Candidates will be eligible to receive DA, HRA and other benefits as decided by the bank from time to time. The Overall CTC of selected candidates will vary from Rs.8.20 lakhs to Rs.13.08 lakhs per annum, depending on the city of posting. The selection of candidates will be done in three stages viz Preliminary exam, Main exam and Interview.